Buildbot is a continuous integration framework written in Python which automates the test, build and release software cycles. It is built using the Twisted networking engine, supports parallel execution of jobs across multiple platforms and runs on all major operating systems. The Buildbot installation can have one or more masters and multiple workers. In this tutorial, we will show you how to install Buildbot master and worker on Debian 9. Now that we have Buildbot installed we can continue and create and configure our first Buildbot master. Do not forget to replace your_ip_or_domain with your server IP address or your actual domain. We will install and configure our first Buildbot worker on the same server as the master. Creating info/admin, you need to edit it appropriately. Creating info/host, you need to edit it appropriately. Please edit the files in /opt/buildbot/worker/info appropriately. The buildbot-worker appears to have (re)started correctly. You can now navigate to http://yor_ip_or_domain:8010/ and start configuring your Buildbot installation. Of course you don’t have to install Buildbot on Debian 9, if you use one of our Linux Server Support Services, in which case you can simply ask our expert Linux admins to install Buildbot for you. They are available 24×7 and will take care of your request immediately. PS. 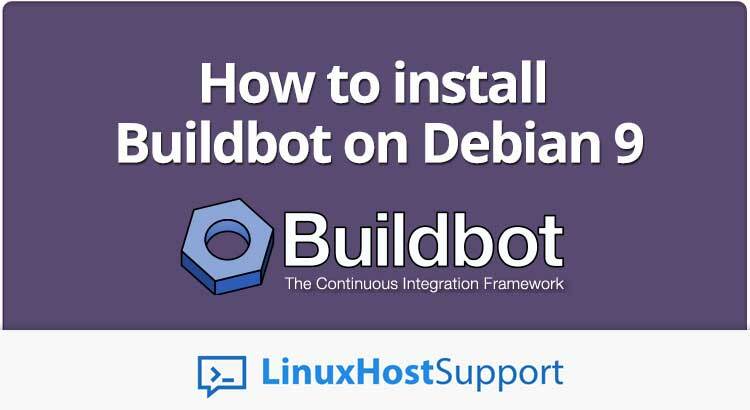 If you liked this post, on how to install Buildbot on Debian 9, please share it with your friends on the social networks using the buttons on the left or simply leave a reply below. Thanks. Thanks for sharing the descriptive information on python course. It’s really helpful to me since I’m taking python training. Keep doing the good work.